Dr. Hamed Assaf is the Chair of the Civil and Infrastructure Engineering Department at the American University of Ras Al Khaimah (AURAK). He received his PhD in civil engineering (water resources) from the University of British Columbia, Canada in 1991. Prior to joining AURAK, Dr. Assaf held faculty positions at the American University of Sharjah and the American University of Beirut. 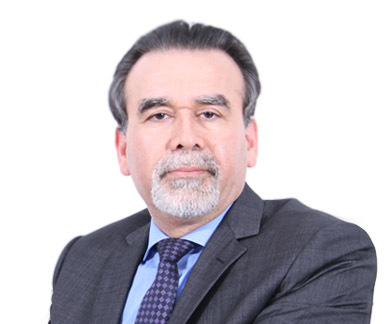 Prior to moving to the Arab region in 2003, Dr. Assaf was a senior risk analysis and water resources engineer in British Columbia Hydro Corporation (BC Hydro), the third largest utility in Canada. Dr. Assaf is a leading scholar in water resources management and climate change. He has conducted several studies on the impact of climate change on water resources, vulnerability assessment, water resources modeling, mass disasters, and geostatistical risk assessment of groundwater contamination. Dr. Assaf has several peer-reviewed publications, book chapters, and reports focusing on the issue of climate change, its potential impact in the Arab region and adaptation options. He has collaborated with several local, regional and worldwide scholars and convened and chaired scientific conference sessions. He has been invited by regional and international organizations including WMO, ESCWA, UNDP and JICA as a keynote speaker, as a panelist, and as an expert on climate change and water resources issues. Assaf, H., Idwan, S. and Farhat, M. (2018), Assessing recycling attitude and behaviour in Ras Al Khaimah, UAE. Journal of Environmental Engineering and Science. https://doi.org/10.1680/jenes.18.00033. Assaf, H. (2018). “الأمن المائى العربى والتغير المناخى: آفاق مستقبيلة”, الفصل الأول فى التغير المناخي ومستقبل المياه, مركز الإمارات للدراسات والبحوث الإستراتيجية, .ECSSR. Assaf, H. and Mohsen, M. (2017). “Overview of Sustainable Water Management in the MENA Green Industries”. Journal of Desalination and Water Treatment. 79 (87-92). doi:10.5004/dwt.2017.21026. 1944-3994 / 1944-3986. Assaf, H., Abdel Monem, T., Abed, A., Al Ajjawi, S., Al Mealla, R., Ekram, N., El Karawy, N., Othman, Y., and Tawfic, M. (2016). “Chapter 3: Outlooks and Emerging Issues”, In “GEO-6 Regional Assessment for West Asia.” United Nations Environment Programme, Nairobi, Kenya. Abed, A., AbuZeid, K., Al Harbi, M., Al Mealla, R., Altaie, W., Assaf, H., Cordeiro, M., Dumble, P., El Karawy, N., El Kholei, A., Glavan, J., Khalil, A., Naser, H., Abdel Aziz, A., Al Ahmad, M., Al Bassam, K., Al Hayek, B., Al Sharif, Y., Arslan, A., Baldwin, R., Burt, J., Byiringiro, F., Eid, E., El Alkamy, H., ElZerey, W., Ghazanfar, S., Grandcourt, E., Jabado, R., Jawad, S., Khalifa, Z., Loughland, R., Nejdawi, R., Othman, Y., Pauli, G., Salem, H., Sattout, E., Warith, M., Abdel Monem, M., Abdulghaffar, N., Dawood, T., Al Khatlan, A., Al Shoala, A., Amasha, A., Awad, H., El Shaer, H., El Tayeb, M., Harhash, K., Hebbelmann, L., Jadam, J., Khalaf, T., Rashed, A., Tawfic, M., and Zalloum, B. (2016). “Chapter 2: State of the Environment and Policy Responses”, In “GEO-6 Regional Assessment for West Asia.” United Nations Environment Programme, Nairobi, Kenya. Assaf, H. (2015), “Analysis of an Anomalous Flooding Event in the Peace River in Canada”, Nature Environment and Pollution Technology, 14 (3), pp 557-562. Assaf, H., Erian, W., Gafrej, R. Herrmann, S., McDonnell, R. and Taimeh, A. (2012), “Climate Change Contributes to Water Scarcity”, Chapter 3 of “Adaptation to a Changing Climate in the Arab Countries”, Verner, D. (ed. ), Washington, DC: World Bank. DOI:10.1596/978-0-8213-9458-8. Dababseh, A., Katich, K., Ashwill, M., Assaf, H., Bassioni, H., Carrington, T., Abdel Galil, I. and El Raey, M. (2012), “Climate Change Affects Urban Livelihoods and Living Conditions”, Chapter 5 of “Adaptation to a Changing Climate in the Arab Countries”, Verner, D. (ed. ), Washington, DC: World Bank. DOI:10.1596/978-0-8213-9458-8. Verner, D., Abu Salman, R., Ahmed, K., Assaf, H. , Dababseh, A., Djernaes, M., El-Mallah, F., Erian, W., Gafrej, R., Gitay, H., Grey, S., Habib, R., Christensen, J., Ismail, S., Katich, K., Levine, T., Losos, A., McDonnell, R., Figueroa, G., Noble, I., Fumero, N., Rabie, T., Stendel, M. and Yang, S. “Implement Policy Responses to Increase Climate Resilience.” Chapter 9 of “Adaptation to a Changing Climate in the Arab Countries”, Verner, D. (ed. ), Washington, DC: World Bank. DOI:10.1596/978-0-8213-9458-8. Gafrej, R., Gitay, H., Abu Salman, R., Assaf, H., and Osman-Elasha, B. (2012), “Biodiversity and Ecosystem services have a Role in Climate Adaptation”, in “Adaptation to a Changing Climate in the Arab Countries”, Verner, D. (ed. ), Washington, DC: World Bank. DOI:10.1596/978-0-8213-9458-8. Assaf, H. (2011), “A Framework for Modeling Mass Disasters”. ASCE Journal of Natural Hazards Review. 12(2): 47- 61. doi:10.1061/(ASCE)NH.1527-6996.0000033. http://link.aip.org/link/?QNH/12/47 (Third top download in the ASCE NH). Assaf, H. (2010), “Water Resources and Climate Change”, Chapter 2 of the Arab Forum for Environment & Development (AFED) report “Water: Sustainable Management of a Scarce Resource”. http://www.afedonline.org/Report2010/main.asp. Assaf, H. (2010), “Integrated Water Resources Management”, Chapter 6 of the Arab Forum for Environment & Development (AFED) report “Water: Sustainable Management of a Scarce Resource”. http://www.afedonline.org/Report2010/main.asp. Assaf, H. (2009), “Impact of Climate Change on Infrastructure”, Chapter 9 of the Arab Forum for Environment & Development (AFED) report “Arab Environment: Climate Change Impact on the Arab World”. http://www.afedonline.org/en/inner.aspx?contentID=433. Assaf, H. and M. Saadeh (2009). “Geostatistical Assessment of Groundwater Nitrate Contamination with Reflection on DRASTIC Vulnerability Assessment: The Case of the Upper Litani Basin, Lebanon”. Water Resources Management. 23(4): 775-796. http://dx.doi.org/10.1007/s11269-008-9299-8. Abdulla, F., Eshtwai‡, T. & H. Assaf (2009), “Assessment of the Impact of Potential Climate Change on the Water Balance of a Semi-arid Watershed”. Water Resources Management, 23(10): 2051-2068. http://dx.doi.org/10.1007/s11269-008-9369-y. Assaf, H. and M. Saadeh (2008), “Assessing water quality management options in the Upper Litani Basin, Lebanon, using an integrated GIS-based decision support system”. Environmental Modelling & Software, 23(10-11): 1327-1337. doi:10.1016/j.envsoft.2008.03.006. Assaf, H., van Beek, E., Borden, C., Gijsbers, P., Jolma, A., Kaden, S., Kaltofen, M., Labadie, J. W., Loucks, D. P., Quinn, N. W. T., Sieber, J., Sulis, A., Werick, W. J., and Wood, D. M. (2008), “Generic Simulation Models for Facilitating Stakeholder Involvement in Water Resources Planning and Management: A Comparison, Evaluation, and Identification of Future Needs”, Chapter 13 of “Environmental Modelling, Software and Decision Support: state of the art and new perspectives”, Jakeman, A.J., Voinov, A.A., Rizzoli, A.E. and Chen, S.H. (eds), Elsevier series on Developments in Integrated Environmental Assessment. Elsevier Ltd.
Voinov, A., Hood, R.R., Daues, J.D., Assaf, H., and Stewart, R. (2008) “Building a community modelling and information sharing culture”, Chapter 20 of “Environmental Modelling, Software and Decision Support: state of the art and new perspectives”, Jakeman, A.J., Voinov, A.A., Rizzoli, A.E. and Chen, S.H. (eds), Elsevier series on Developments in Integrated Environmental Assessment. Elsevier Ltd.
Crout, N., Kokkonen, T., Jakeman, A., Anderson, R., Assaf, H., Croke, B., Gaber, N., Gibbons, J., Holzworth, D., Mysiak, J., Reichl, J., Seppelt, R., Wagener, T. and Whitfield, P. (2008), “Good modelling practice”, Chapter 2 of “Environmental Modelling, Software and Decision Support: state of the art and new perspectives”, Jakeman, A.J., Voinov, A.A., Rizzoli, A.E. and Chen, S.H. (eds), Elsevier series on Developments in Integrated Environmental Assessment. Elsevier Ltd.
McIntosh, B.S., Giupponi, C., Smith, C., Voinov, A., Matthews, K.B., Monticino, M., Kolkman, M.J., Crossman, N., Ittersum, M. van, Haase, D., Haase, A., Mysiak, J., Groot, J.C.J., Sieber, S., Verweij, P., Quinn, N., Waeger, P., Gaber, N., Hepting, D., Scholten, H., Sulis, A., van Delden, H., Gaddis, E., and Assaf, H.(2008), “Bridging the gaps between design and use: developing tools to support management and policy”, Chapter 3 of “Environmental Modelling, Software and Decision Support: state of the art and new perspectives”, Jakeman, A.J., Voinov, A.A., Rizzoli, A.E. and Chen, S.H. (eds), Elsevier series on Developments in Integrated Environmental Assessment. Elsevier Ltd.
Assaf, Hamed (2007) ”An Empirical Model of Fatalities and Injuries Due to Floods in Japan” by Guofang Zhai, Teruki Fukuzono, and Saburo Ikeda (Paper published in August 2006 issue). Journal of the American Water Resources Association 43(5): 1344-1346. doi:10.1111/j.1752-1688.2007.00109.x. Assaf, Hamed (2007) “Development of an Energy-budget Snowmelt Updating Model for Incorporating Feedback from Snow Course Survey Measurements”. Journal of Engineering, Computing and Architecture, 1(1). Assaf, Hamed and M.C. Quick (1991), “Updating Hydrological Model Forecasts”. Canadian Journal of Civil Engineering, 18(4), 663-674.